New Setting the East Ablaze Figures! Three new Tibetan figures have just been added to our Setting the East Ablaze Range - Just look under the Forgotten Front Miniatures Heading to find the Setting the East Ablaze range. 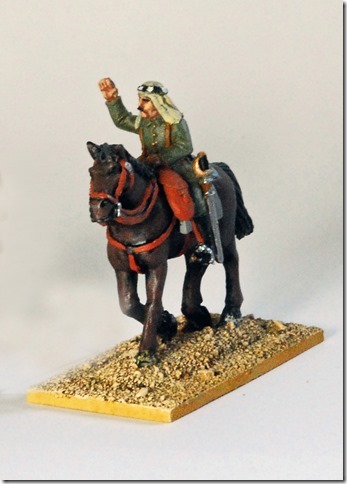 Take a look at these lovely Chinese Cavalry figures from our Setting The East Ablaze 1914 - 1930 range. Painted for us by Mark Hargreaves of Over Open Sights. The good people of Little Ninja Painting have done a cracking job with these zombies apocalypse survivors from our Bullets and Brians range. A sneak peek at some great new figures coming to Matchlock Miniatures. 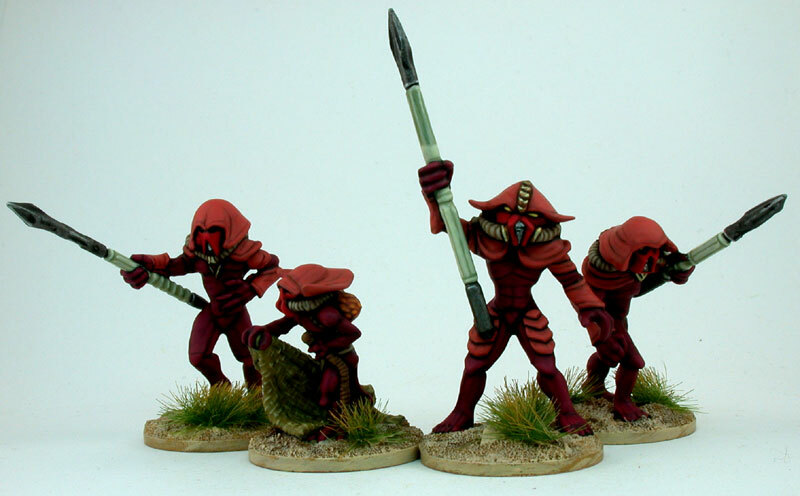 Great 10mm Modern Paint Jobs! Barry Evans of Miniature Figure Painter has sent us an example of there work which you can see below. 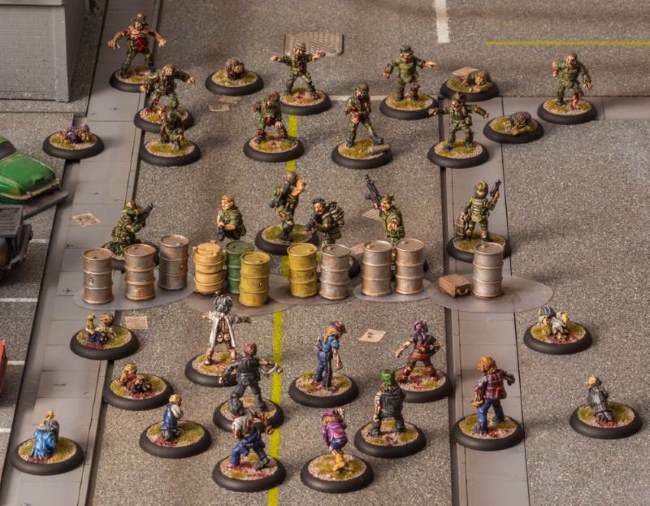 The figures are all from our 10mm modern American range. We have added some classic Tunnel Elves (ARE11-21) that can be found under 25mm Classic Fantasy & Sci-Fi / Aureola Rococo. We have also added another of the Knights of the silver rose (ARH4). A plethora of additions to our classic 'SPACE WARRIORS & SCI-FI' range, which you can find under 25mm Classic Fantasy & Sci-Fi. We have also added a few more codes to our 'Classic Fantasy' Range as well. We have yet more additions to our classic fantasy ranges. With first of all a half dozen more Skeletons to be found under 25mm Classic Fantasy & Sci-Fi / Skeletons. Also, we have added to more figures to our 25mm Classic Fantasy & Sci-Fi / Classic Fantasy. 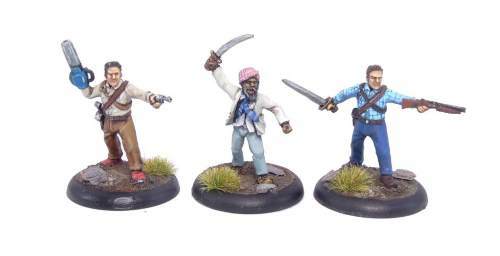 Due to popular demand, we have re-issued the old 25mm Pirates range. To find them just take a look under our 25mm Catalogue under From to Shot. Also, we have just added VFW112 Throne Litter Bearer, to the Swamp lords range under 25mm Catalogue, Classic Fantasy & Sci-Fi Ranges. We thought you'd like to know that the 28mm zombie range BULLETS & BRAINS is now owned by us. It's unique in that each civilian/military figure is mirrored by a zombified version. All sold individually. We are looking for your photos of your 15mm or 25mm Minifigs Ancients, Dark Ages or Medieval. Must be of publishable standard. We now have the Weird WWII Two range from Playwar- A very nice set of typical German and US 28mm plus Soviet Apemen and a few strange Third Reich nasties. Still Living on the Frontlines! Our range of figures for Winter of '79: Living on the Frontline is expanding all the time. To go with the latest Land Rover, weapons and figures we've also got a new round of armed civilians and the latest Grenadiers. Click the link on the left for full details. The year is 1979. The setting is a dis-United Kingdom. Civil unrest wracks the streets of Great Britain and it's up to you to put a stop to it and restore order - or to cause a ruckus! An exciting new set of rules now on sale at Caliver Books - 'Winter of '79 - Living on the Frontlines' is also available here, where we've also got a fantastic range of unique figures. Just check out the links over on the left hand side of the page to see the range of figures and order the rules too. The Matchlock Miniatures Napoleonic Ottoman Turk range expands further with six new cavalry figures now in production. Pictures of these exquisite sculpts are below. All come with horses and are available to order now from the menu on the left. Exciting new Valley of the Four Winds Releases! We've got some very exciting news in the shape of Demon King Luz, his Amazon captive and dancing demons - this makes up VFW SET 1 and is one of many re-released figures which are adding to our VFW range as we rediscover old moulds! Here are some painted examples of our latest Napoleonic Ottomans. Painted by one of our newest staff members, Jasmin Storey-Smith. Minifigs now producing Koenig Krieg miniatures! We are very proud to announce the acquisition of our new range, the Koenig Krieg 15mm Seven Years' War miniatures! The 28mm range will follow and we've also got 20mm Vietnam and 15mm US Marine Corps ranges too. 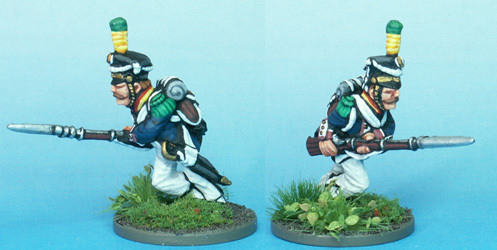 Check out the ranges under Matchlock Miniatures over on the left hand menu. 25mm Mexican American War back in production! Great news! We've found one of the missing 25mm Mexican American War moulds. These lovely figures are back in production and available to buy now. Just look under '25mm Colonial Wars' over on the left. Latest additions to the ever-growing Matchlock Miniatures range are these lovely Napoleonic Ottomans. Available now from under the Matchlock 28mm link over on the left. The latest releases in the Forgotten Front WW1 range are these lovely Turkish troops in 28mm. Check out the Forgotten Front link over on the left for more details. SOTCW Review Minifigs 10mm Vehicles! The Society of Twentieth-Century Wargamers have reviewed some of our latest vehicle releases. We've been busy getting together a whole bunch of new releases at Minifigs. A few of the latest are 10mm tanks and vehicles. Here's a picture of our Sturmtiger (GV103) which is available under 10mm over on the left. With the Allied armies approaching from both directions, and their own armed forces almost spent, in 1945 the German people took to defending their homes by themselves. Now you can add them to your tabletop thanks to our latest range of Volkssturm figures! 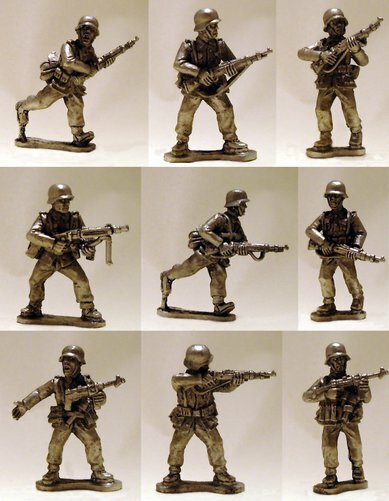 An ever-expanding range of superbly sculpted 28mm civilians with weapons, perfect for defending the vulnerable people of the Reich from the rampaging Soviet hordes and the advancing Western Allies! 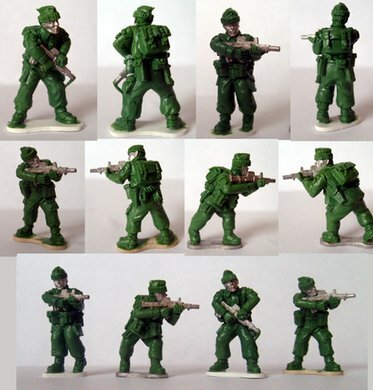 Available now under 'Matchlock Miniatures 28mm' over on the left is the complete range. And it's a stunning masterpiece of sculpting, its battlefield presence is just enormous - and we've not even released the War Machines yet! 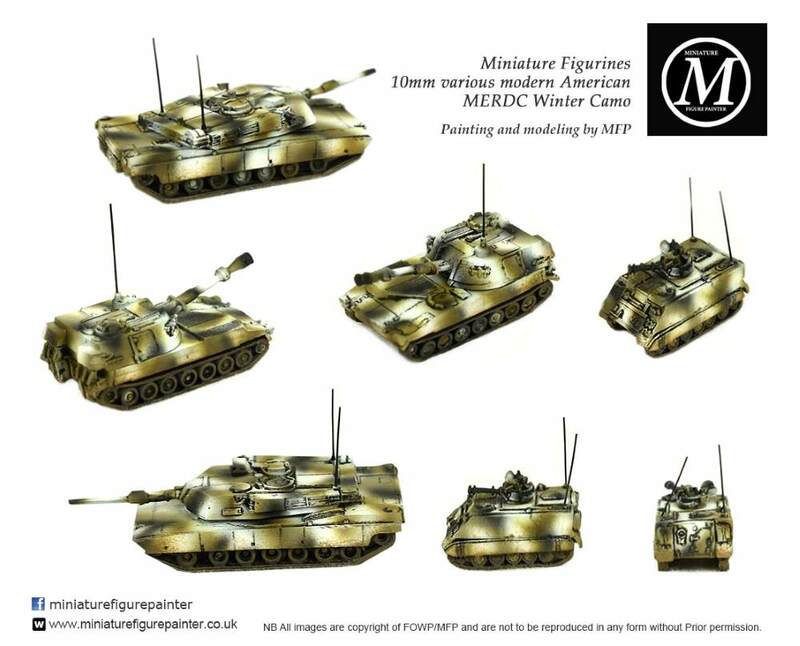 The lovely range of RPG Manufacturing miniature tanks is continuing to expand, with the latest release being the iconic British Churchill Infantry tank. Available in a variety of scales - as are all the RPG tanks - the detail is exquisite even on the smallest model, and it'll fit right alongside your British infantry and Armour. 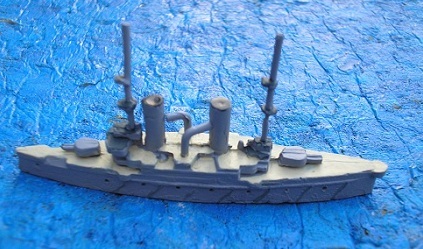 The picture below shows the 1/144th (12mm) model, available now from the link on the left hand side of the page. Great War of the Worlds! We've noticed that those splendid chaps at Alien Dungeon in the USA, using local talent Rick Priestley and Alessio Cavatore, are storming ahead with their 15mm Martian WW1 variant. We are now starting to steadily and (very) slowly release the 28mm figures for our 'Great War of the Worlds' range, sculpted by the famous Gary Morley and Andrew Ellis. We think it's such a brilliant concept that there's definitely room for two variants in the market. Keep your eyes open for more Martian news. Minifigs Welcomes Miniature Design Studios! We'd like to announce that we've taken on board the truly excellent Miniature Design Studios ancient range - check out the link on the left for details of how to get hold of them. ...unfortunately it's not the best outcome we hoped for. It doesn't seem that the Kickstarter has roused enough interest to make the Pacific War range as viable as we'd hoped. As a result we're going to try it the old-fashioned way. Check out the Matchlock 28mm Pacific War range on the links to the left, where you'll see the first few figures we've got ready to go. If they do well we'll bring you more! The first samples of our forthcoming Pacific War range have returned from the skilled hands of our sculptor. As you can see, they're terrific - and these three figures will be available to buy, but they'll be a very lonely army without their friends, and those will only be possible if the Kickstarter project succeeds. Below you'll see a Peruvian Infantry Bugler, Peruvian Officer and Peruvian Infantryman ready for action. Now they need some Chileans and more importantly, some comrades! UPDATE! Latest news - The Kickstarter project closes in FIFTEEN DAYS' TIME! You've got until February the 1st to register your interest in this under-represented area of history. If we don't receive enough interest before the deadline we'll move onto our next, exciting project! 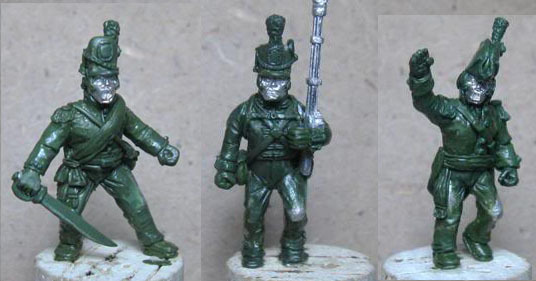 Continuing our good news theme, the latest Forgotten Front Miniatures are just off the casting machines! The first of a range of Wolseley-helmeted Highlanders, perfect for Palestine and Setting the East Ablaze, are now available. Check out the catalogue for details - and see the pictures of the prototypes! By now you've all probably heard of the Kickstarter scheme. Well, we decided it was time to give it a go and we've got the project for you! We've got a list of rewards for those who register their interest - so don't miss out on yours! The troops of the Spanish Civil War need armoured cars in the smaller scales just as much as they did in real life - and now Matchlock Miniatures are prepared to supply! Check out the master for the Bilbao Armoured Car in 15mm. We'll be ready to put this masterpiece into full production shortly - your troops have never had it so good! Yes, they've arrived and set up camp at Minifigs - just check out the detail on the models in the picture below. They're now available for you to purchase to examine for yourselves - see the link on the left hand side. These pictures really demonstrate how incredible these figures are! Siberia Miniatures' range of 28mm Imperial Russian Army 1914-1921 will soon be available from Miniature Figurines, and what a range they are! Here are the infantry, but there are command and support units available too. Keep watching for updates! Our Ever-Expanding Duchy of Warsaw Napoleonic range sees its latest additions in the shape of Lancers and Artillery - available now! We have a new line of figures for our Matchlock 28mm Ranges. The Duchy Of Warsaw 1809-1812. We are pleased to announce that we have acquired the superbly detailed & extensive Wild West Line from the Honourable Lead Boiler Suit Company. Many thanks to evilcartoonist over on TMP for the nice group photo. 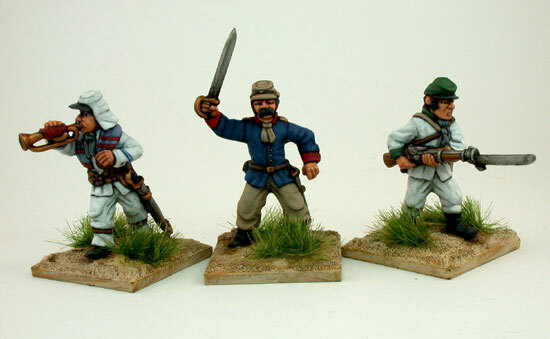 Now here is something a little out of the ordinary some lovely new sculpts for the Czech Legion check in the 28mm Matchlock Miniatures section for them! Well to start a new 12mm range for Spanish Civil War we have. 28mm WWII Poles just released. Just take a look at these beauties painted up for us by the nice people at Artmaster Studios. MATCHLOCK IRISH WARS and DARK AGES 15mm are up and ruining- and there are even some pictures. As a wargamer with boxes of odd unpainted figures from over 45 years of wargaming myself I have always been less that enthusiastic about buying figures in packs. It always seemed a waste of precious hobby money. The idea of this is to to help you make the regiments you want by selling you exactly what you need without wastage. I'm afraid it's not about selling wadges of single figures. The problem with selling 15mm MINIFIGS individually is the size of the range. To keep even a handful of each in stock would require vast storage areas and tie up tonnes of metal just in case. The other option is to cast a single figure to order- which involves pulling a mould, spinning it a few times to get it warm up enough to and re-file the mould out of the thousand we have . Which just for one or two figures makes no economic sense. That said, we are happy to do so at a premium price if you contact us. Just a quick note to let you know that the Matchlock 28mm range is back up and running. Just take a look at these nice Penninsula War paint jobs from Artmaster Studio to see how they are turning out. The good news is that after months of solid casting (and expensive overtime ) recently most orders have left well within the 21 days, with many now under 14 days. Whilst we will shortly get down to a period when many orders will be done within 7 days, to be honest we need to spend a LOT of time renewing moulds and taking photos - as well as adding new ranges- so the chances of us casting daily to order will not happen for a while. Now that we are almost on top of the casting (famous last words!) we can do rush jobs for those urgent display games and birthday/Christmas presents. The cost will be an extra 10% of the order BEFORE postage with a minimum of £2.00 extra. This can only be done if paying by credit card. We are one of the last companies to still have large numbers of single figure codes so that you don't have to buy more 25mm than you need. The first of our War of 1812 range is out now and here is a few painted up just to show you. New from MATCHLOCK MINIATURES War of 1812 28mm just have a look at some of the lovely greens! Many of you have asked to be able to buy figures individually. As a trial we are selling NAPOLEONIC 15mm at 30p per foot, 60p per horse figure. COMMAND NOT INCLUDED . Obviously it is cheaper to buy them in full packs if you can. To save confusion this can be done ONLY via the CALIVER BOOKS website using the custom order section and paid for by credit card. Individual codes cannot make up more than half of all codes ordered. I.e if you buy 10 packs you can only buy individuals from no more than 10 codes- It is not worth the time pulling and replacing moulds for whole orders of sample figures. Don't forget to tell us which codes are individual and which codes are packs. ! A thank you from all the Caliver Team for all your support during 2009. Your patience during the integration of MINIFIGS into an already broad based and very busy company was particularly appreciated. Production of all ranges back in full swing. Just to let everyone know that we are fully back in operation and that we are working our way steadily though all the back orders. well, all the moulds , machines etc are now installed in Nottingham. The 12mm ranges are now sorted. the orders for those should start trickling out towards the end of the week as we slowly work our way through the systems, get used to the machines and moulds etc. Just to inform everyone who has an existing order and all those placing new orders. Due to the change of ownership and location, there will be a delay of around 6 weeks before normal production recommences. If this delay is too great please contact us and we will refund your money, we are sorry for all the inconvenience this causes. Good luck Liz & Neil, and thanks for keeping MINIFIGS alive during the Dark Times! We would like to apologise to anyone who has tried to contact us via telephone over the past couple of weeks. Due to a staff shortage we have not been able to man the telephones as we would have liked, but hope to have this resolved soon. We are, however, still processing orders and responding as quickly as we can to queries via email, so if you have any queries please do not hesitate to contact us. Sorry for any inconvenience caused and thank you for bearing with us. Due to maternity leave and staff sickness it is taking us longer to process orders than it would normally. We are sorry for the delays; we hope to get back to some form of normality soon. Good news, baby Ben was born to Liz and Bill this morning at 3.13, I hope you will all join with me in wishing them all well. We are currently out of stock of these rules and awaiting the new and improved version from Pete. All those customers that have orders with us and have not yet received their rules, we will get them to you as soon as we can. As promised here are the new releases for the 12mm WWII and Modern ranges, all have been added to the catalogue and have pictures. Just a sample picture of what will be coming out in January. We will be molding these in the 1st couple of week in January so look for the new list of WWII and Modern items towards the end of the month. We would like to thank all customers for their support over the past year and especially the last 6 months with our move. We would like to take this opportunity to wish you all a merry Christmas and a happy new year. We will be closing the unit around lunchtime on the 24th December and reopen on 5th January 2009. After a month spent trying to sort out access to the Internet at the new unit, the move taking more time and effort than expected, we are now back in full swing. We have had to delay the release of new items for the 12mm range as we are trying to clear back orders, we still hope to have these new 12mm items out before Christmas. We would like to extend a big “THANK YOU” to those that have helped us over the past couple of months; we are now looking forward to future. We now have a new telephone number: +44 (0)2380 528 907. Unfortunately we will be off-line for 5-10 days due to the move, but you can still place orders using the above number or alternatively, place your order on the web site and we will process it once we are back on-line. As promised here is the new address for the company, we hope to keep the same phone number but if we are unlucky we will of course let you know. We will of course have a mail re-direct in place just in case. We have added pictures to the French range and updated and added some more to the German. On another subject, Minifigs will be moving within the next couple of months. We will publish the address closer to the time of the move. This should not upset our turnaround to much although we will be working closer to the 21 day time scale. We hope you will all be able to bare with us. More 12mm WWII german vehicals have been added to the website. We have completed the Imperial Rome basic figure pictures and have now started on the Greek and Persians. We have started adding pictures to the 25mm Ancient range; the 1st pictures are up in the Imperial Rome section of the catalogue. We have added pictures this week that where requested at Salute. The pictures are of the following ranges, Montcalm and Wolf, Indian of 1790 and the Hussite Wars. All the pictures of World War One Infantry are now up on the site, hope to have the Cavalry done next week, although we are now on the run up to Salute 08 so we might not have time. We will post our stand number next week so people can come up and see us if they wish. Hope everyone had a good Easter. We have finished of the photos for the 15mm Franco-Prussian range and have made a start on World War One, just the British Infantry at the moment, more to be added next week. We have finished the 15mm Feudal Europe and Crusades range, and we have made a start on the Franco-Prussian War figures. Have finished all the basic 25mm English Civil War figures, completed the 15mm Feudal Europe and Crusades Infantry, hope to have the cavalry done next week. We have added all the basic 25mm Seven Year War infantry and cavalry figures and made a start on the 25mm English Civil War range as well. Here is a list of all the new 12mm items added to the site today. 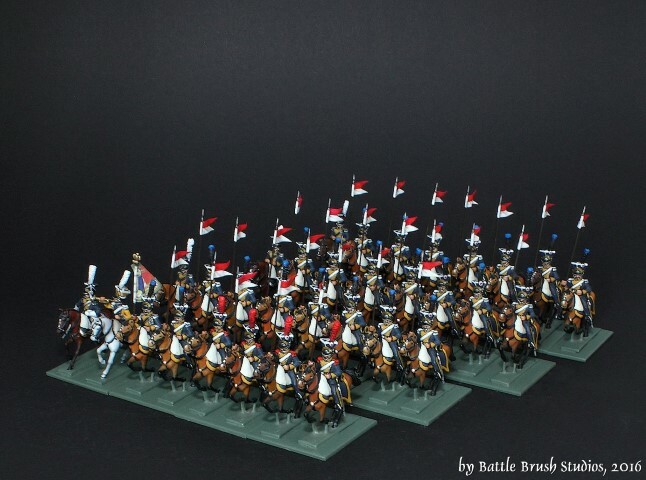 Have added the rest of the Austrian 25mm basic infantry and cavalry, also added today were the Spanish, Dutch, Belgium, Bavarian, Wurtenburg, Danish, Swedish, Nassau and Portuguese. 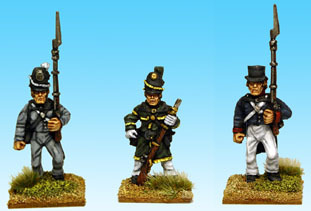 This should now cover all the basic troop types for our 25mm Napoleonic ranges. 15mm Prussians and 25mm French Napoleonic are finished and we have added the basic infantry and cavalry to the 25mm Prussians, Russians, Duchy of Warsaw, and Brunswicks and made a start on the Austrians. More pictures have been added to the 25mm Napoleonic French, we have also added the infantry and infantry commands to the 15mm Napoleonic Prussian. 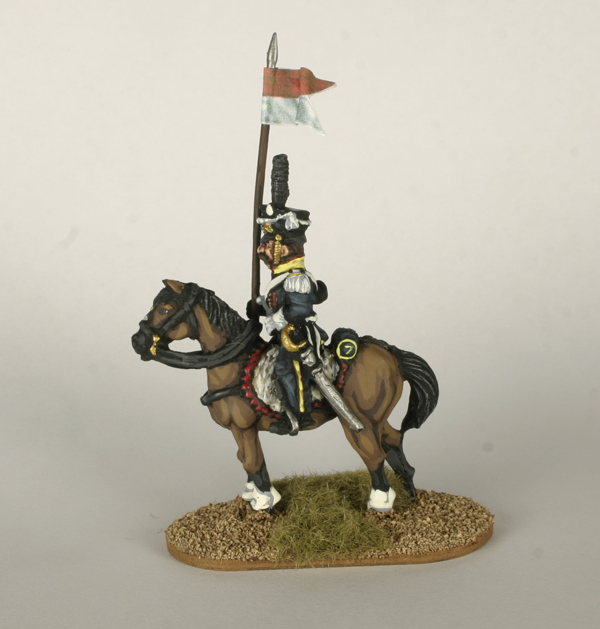 We hope to add the cavalry and commands to the Prussians and more to the 25's next week. We have added some new pictures to the 25mm Napoleonic British and French catalogue pages; these are of the basic infantry and cavalry figures. All the pictures where taken using figures that have been through the molding process, you will notice that some are darker than others, this is just a discolouration that is caused by that process, nothing more. We would just like to say welcome to the new look Miniature Figurine web site. We hope you like the new look, and you can find what you want for your gaming needs. All content © 2019 Miniature Figurines Production. Site created by Peter Andrew Jones 2007.